This machine is in excellent condition. It has been well cared for and serviced by me, Bernina-trained mechanic. 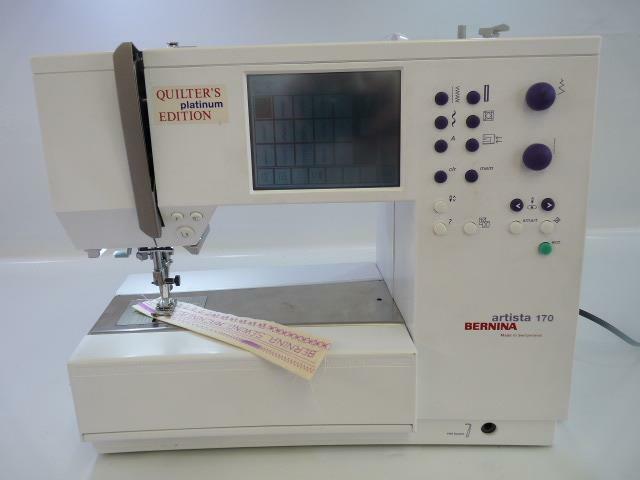 This machine has lots of built-in stitches including alphabets, embroidery stitches, buttonholes etc. as well as all the basic stitches that you could ever need. Instruction Binder with full set of Instructions. I thought I would add a bit more information. The machine is programmed to do 9 different buttonholes either automatically or manually. Once set they will repeat as often as you like. One of the ways is to use your button and hold it against the screen and the computer in the machine calculates the size for you. It will do eyelets and it has a great button sewing-on facility. It has many practical stitches - too many to count. Lots and lots of decorative stitches, quilt stitches and several different styles of alphabets. With The embroidery module you can purchase extra embroidery cards and there is also some software available so you can really go to town on embroidery. In short this machine has everything you could possibly need.